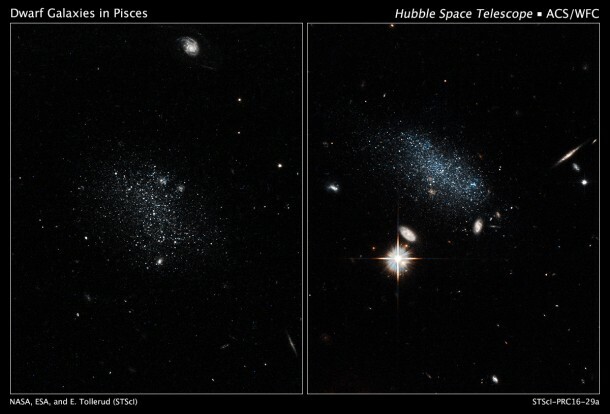 NASA’s Hubble Space Telescope has uncovered two tiny dwarf galaxies that have wandered from a vast cosmic wilderness into a nearby “big city” packed with galaxies. After being quiescent for billions of years, they are ready to party by starting a firestorm of star birth. Under the steady pull of gravity from the galactic big city, the loner dwarf galaxies have at last entered a crowded region that is denser in intergalactic gas. In this gas-rich environment, star birth may have been triggered by gas raining down on the galaxies as they plow through the denser region. Another idea is that the duo may have encountered a gaseous filament, which compresses gas in the galaxies and stokes star birth. Tollerud’s team determined that the objects are at the edge of a nearby filament of dense gas. Each galaxy contains only about 10 million stars. Dwarf galaxies are the building blocks from which larger galaxies were formed billions of years ago in the early universe. Inhabiting a sparse desert of largely empty space for most of the universe’s history, these two galaxies avoided that busy construction period. The dwarf galaxies are small and faint, so finding them is extremely difficult. Astronomers spotted them by using radio telescopes in a unique survey to measure the hydrogen content in our Milky Way. The observations captured thousands of small blobs of dense hydrogen gas. Most of them are gas clouds within our galaxy, but astronomers identified 30 to 50 of those blobs as possible galaxies. The researchers used the WIYN telescope in Arizona to study 15 of the most promising candidates in visible light. Based on those observations, Tollerud’s team selected the two that are the most likely candidates to be nearby galaxies and analyzed them with Hubble’s Advanced Camera for Surveys. Hubble’s sharp vision helped the astronomers confirm that both of them, Pisces A and B, are dwarf galaxies. The Hubble telescope is aptly suited to study nearby, dim dwarf galaxies because its sharp vision can resolve individual stars and help astronomers estimate the galaxies’ distances. Distance is important for determining a galaxy’s brightness, and, in these Hubble observations, for calculating how far away the galaxies are from nearby voids. Pisces A is about 19 million light-years from Earth and Pisces B roughly 30 million light-years away. Based on the galaxies’ locations, an analysis of the stars’ colors allowed the astronomers to trace the star formation history of both galaxies. Each galaxy contains about 20 to 30 bright blue stars, a sign that they are very young, less than 100 million years old. Tollerud’s team estimates that less than 100 million years ago, the galaxies doubled their star-formation rate. Eventually, the star formation may slow down again if the galaxies become satellites of a much larger galaxy. Tollerud’s team hopes to observe other similar galaxies with Hubble. He also plans to scour the Panoramic Survey Telescope and Rapid Response System survey (PanSTARRS) for potential dwarf galaxies. Future wide-survey telescopes, such as the Large Synoptic Survey Telescope (LSST) in Chile and the large radio telescope in China, should be able to find many of these puny galactic neighbors. The team’s results will appear in the Aug. 11 issue of The Astrophysical Journal.